The course will consist of quarterly 3-day immersion weekends (Fri-Sun) from 8:00am to 5:00 pm conducted in Olympia, WA, with a focus on hands on practicums and review of essential theories, diagnostics and practice management. On line presentations in between the immersions weekends will consist of a variety of on-line learning tools including video, lectures, forums and reading assignments. On line consultations by appointments will also be available to students throughout the program and after graduation. In November 2017, the State of Washington, Department of Health, Nursing Quality Assurance Board approved the inclusion of medical acupuncture for Nurse Practitioners with 300 hours training from an accredited program of study. If you are enrolling from another state, we advise you to check with your state board of nursing to insure medical acupuncture is allowed and the criteria is the same. A 300 hour training course for primary care clinicians who want to incorporate the tenants of Traditional Chinese Medicine (TCM) into an Integrative Approach to Care. 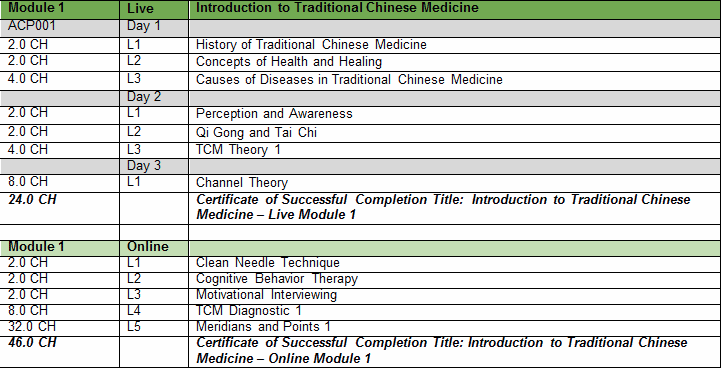 The course will review assessment, diagnosis and treatment of diseases using the theories and therapies of TCM in addition to reviewing concepts of healing and health, evidence based practice and how to use the tenants of TCM as part of an integrative approach to health that focuses on medical/TCM treatment while individualizing therapies to promote health and healing. 2. Demonstrate proper acupuncture techniques, differential diagnosis, and its application in clinical practice. 3. Review how acupuncture therapies and collaboration with acupuncturist can be applied to clinical practice. 5. Review the evidence-based research regarding the efficacy of techniques used in TCM. The course material will be accessible via student enrollment and distributed during the immersion weekends via internet postings and/or thumb drive. Handouts can be requested prior to the onset of classes at an additional cost and will be distributed in class and updated throughout the course. In addition various electronic apps will be used to facilitate the learning experience to include on-line conferences, smart phone apps and verbal communications as needed. There are a number of text that can be used for the course however, many can be acquired through e-text as well or smart phone apps. Specific reading assignments and course material will be distributed in class throughout the course. There will also be links to electronic resources necessary to prepare for class and to complete learning activities. Recommended Text: Students can also opt for e-books and on line apps when applicable. Below is a tentative list of text however, class specific text will be determined by instructor and included in the student class instructions. Li, H. (2016). The Li Lineage of Acupuncture and Traditional Chinese Medicine, SRP Publishing, Shanghai China. Macioca, G. (2005). The Foundations of Chinese Medicine: A Comprehensive Text for Acupuncturist & Herbalist. Second Edition. New York, NY: Churchill Livingstone. Kaptchuk, T.J. (2000). The web that has no weaver. New York, NY: Contemporary Books. Macioca, G. (2007). The Practice of Chinese Medicine. Second Edition. New York, NY: Churchill Livingstone. Concepts of Health – Flaws,B. Imperial Secrets of Health and Longevity, 2007, Blue Poppy Press, Denver,CO. You are required to attend on campus classes unless arrangements are made in advance. Your active engagement and participation is essential to having a meaningful learning experience. Participation in web based modules requires that you meet all deadlines for the learning activities and successfully complete them. Lack of full participation will lead to a potential loss of CE credit or disenrollment from the course. Successful completion of practicums and test are required to receive final certification from the course. If for any reason a participant is unable to successfully demonstrate competency in the practicum or pass a test on the first attempt all efforts will be made to repeat testing or provider interim tutoring if needed. This may require the participant extent their stay by an additional day during the immersion weekend if needed. ONLINE SEMINARS/LECTURES – Online seminars/lectures are developed for introduction to the subject matter and will require additional time and readings to fully comprehend the content. If for any reason during the course, you feel you do not have a full comprehension of the material it is imperative that you inform the lead instructor via email or phone before the next immersion weekend since the course material is presented in an order that builds on previous lecture material. Reasonable accommodations are available for students who have a documented disability or hardships. Please notify the director and/or instructor before the start of the Quarter if you have any accommodation or transportation needs or requirements. Late notification may cause the requested accommodations to be unavailable. Integrity and ethical behavior are the expectation of the program. What makes this program so unique is that the majority of the course instructors are licensed acupuncturist and participants are western trained clinicians. Therefore, it is essential that we learn from each other without criticism or confrontation. Courtesy and respect are critical to the learning process and anything less will not be tolerated either by students or instructors. If you have any concerns please notify the program director immediately. Learning will occur through the use of readings, discussions, in-class activities, web based activities, and assignments. The instructor may change the syllabus as needed to facilitate student learning. Students are expected to have completed the assigned readings and other preparatory work as a basis for interaction. Faculty-student and student-student interaction will occur in the classroom as well as online through web based modules or email as provided. Participants can always contact the course director Dr. McPherson via his email address at any time as well. The majority of the program will be web based however, immersion sessions will take quarterly with a focus on practicums and introduction of complex theories. The web based modules are designed to promote self-guided learning and foster interactions among the class members. Much of what makes this class interesting is the development and exchange of ideas. The goal of the web based activities is to stimulate your interest and learning experience and create a venue for thought provoking dialogue that can be shared during the immersion weekends. .
1. Practicums require each person to participate. Because the practicums will require students to perform acupuncture techniques and receive acupuncture therapy, participants must complete (admission forms) an informed consent to participate and agree to confidentiality standards when discussing student health issues. 2. Practicums will be focused on students successfully demonstrating proper clean needle technique, point identification, proper needle placement and insertion techniques to include other acupuncture therapies (e.g. cupping, guisha, etc.). 3. During the practicums, students will be placed in small groups of 4 and supervised by a Licensed Acupuncturist to insure safety and time for individual instructions. 4. During practicums, certain areas of the body will require exposure. To insure privacy and comfort, we recommend that clothing be loose and there is proper coverage of other body areas. If at any-time the student feels uncomfortable receiving therapy, they should notify the instructor immediately and/or the course director if they perceive any level of non-professional or non-courteous behavior from an instructor or student. 5. If you have physical disability or any concerns or aversions to participate in the forums or practicums, please call or e-mail the program director. 6. Please keep track of due dates. These are in the syllabus and on-line. You will receive e-mail reminders as well. 7. Although immediate changes to the course are difficult, our goal is to insure your learning experience is the course is professional and valuable. 8. Your feedback is very important to us. Please let us know at any-time how we can improve the course and your experience in it. There are no letter grades for the course. Successful completion is based on demonstrating competency 1) successful completion of practicums; 2) test results 3) forum discussion 4) instructor evaluations. Lack of class participation, failure to complete web-based assignments, and/or failure to complete the above will result in forfeiture of a certificate of completion and CE credit. Nurse practitioners desiring to incorporate acupuncture using the tenants of Traditional Chinese Medicine (TCM) into their practice should complete all 372 contact hours of this program to achieve a Certificate of Training from the Acupuncture and Integrative Medicine Institute. Successful Completion of all 6 modules including the hands-on practicums plus 100 hours of clinical observation will provide you with the foundational skills to safely perform acupuncture and practice an Integrative Approach to Care incorporating the tenants of Traditional Chinese Medicine. Each module is designed in an immersion 3-day weekend with online course work and practical time between immersion weekends to advance your skills. Components of this program include: assessment, diagnosis and treatment of diseases using the theories and therapies of TCM; reviewing concepts of healing and health; evidence-based practice and how to use the tenants of TCM as part of an integrative approach to health; and medical/TCM treatment that individualizes therapies to promote health and healing. Advanced Practice Registered Nurses (ARNP) and Advanced Practice Nurses who want to add medical acupuncture techniques to their practice. You will gain foundational understanding and practical skills to safely perform acupuncture and an Integrative Approach to Care following the tenants of Traditional Chinese Medicine. Participants must hold an active, unencumbered ARNP or APN license to practice in the respective state in which they maintain clinical practice. Participants must provide proof of malpractice insurance at the ARNP or APN level. Each module must be completed in sequence in order to achieve a Certificate of Training from the Acupuncture and Integrative Medicine Institute. To receive a Certificate of Training from the Acupuncture and Integrative Medicine Institute, a participant must demonstrate competency by completing all 6 modules within this program. The Acupuncture and Integrative Medicine Institute reserves the right to withhold a Certificate of Training to any student who does not complete the requirements of the program or the requirements of any specific module. This program is presented in joint partnership with Acute Care Education. Learners will be awarded contact hours from Acute Care Education upon Successful Completion of each module. Lack of class participation, failure to complete web-based assignments, and/or failure to complete the requirements of any module will result in forfeiture of a Certificate of Successful Completion for that module and require repeating the module to complete the training. Description: During the initial immersion weekend students will be introduced to the history and concepts of Traditional Chinese Medicine (TCM); begin to explore different clinical approaches to health and healing; gain a general review of the basic concepts and theories of TCM that are used in acupuncture therapy; and receive an introduction to Acupuncture points, and channel theory. The Online Module will review Clean Needle Technique, continue review of TCM theory and discuss western therapies that enhance the patient-practitioner interaction and interview skills to help individualize therapy. You will develop a foundational understanding of Traditional Chinese Medicine. Description: Module 2 begins with a 4-hour practicum to review and perform safe needling and clean needle techniques prior to a skills lab to review and test points on the lung/Large Intestine/Stomach and Spleen Channel. It will continue to review TCM diagnostic theory and practical application. The Online Module introduces the use of TCM theory and how it can be applied to an integrative approach to care, supported by continued review of points, channels, microsystems and additional review of other medical theories; e.g. Nutritional, Functional and Genetic that correlate to TCM theory. You will demonstrate an understanding of safe needle application and use of diagnostic skills of Traditional Chinese Medicine. 4. Describe potential ways to integrate various principles of TCM and IM into a western clinical practice. Description: Module 3 continues to expand on TCM theory and differential diagnostic and clinical skills. Reviewing the heart/small intestine, pericardium/san jiao channels and specific differential diagnosis associated with them. Testing specific points and proper needling techniques and review of microsystems. In addition, Module 3 will introduce the first of a series of Integrative therapeutic lectures that address specific diseases, starting with Respiratory, Gastrointestinal, Genital and Urologic disorders. The online module will review the power of the senses and how they are used to promote healing and facilitate treatment using the tenants of TCM. Description: Module 4 continues to expand on TCM theory, differential diagnostic and clinical skills. Reviewing the liver/gallbladder, urinary bladder/kidney channels and specific differential diagnosis associated with them. Testing specific points and proper needling techniques and review of microsystems. In addition, Module 3 will also introduce the use of adjunct therapies used in TCM including laser therapy, Electro-Acupuncture, Scalp acupuncture, and Ion Pumping cord therapy. We will continue review of Integrative therapeutic lectures that address specific diseases, Gynecology, Musculoskeletal and Neurologic disorders. The online module will review the power of movement and how it is used to promote healing and facilitate treatment using the tenants of TCM. In addition, there will be an introduction to Chinese Philosophy and its relevance to TCM therapy. You will demonstrate an understanding of TCM theory, apply various treatment techniques, and develop an understanding of Chinese Philosophy. 1. Demonstrate proper location of points and needling technique including the use of adjunct therapies. Module 5 will continue Integrative therapeutics focusing primarily on the treatment of pain. Additional lectures will address specific diseases of the mind and sexual function. The online module will review issues of legality, ethics, health care and risk management. You will demonstrate an understanding of TCM theory as it applies to specific diseases, practice legalities and ethics, and associated risks of acupuncture therapy. 2. Discuss and interpret issues of legality, ethics and risk associated with acupuncture therapy. Description: Module 6 will continue Integrative therapeutics focusing primarily on the treatment of pain and mental health. In addition, there will be an introduction to Herbal theory and how it can be applied to an integrative practice. Note: Only a general overview of Chinese Herbs will be discussed so that students will have enough information to refer to a TCM practitioner who prescribes Chinese herbs. Practicum Module 6 is a clinical observation practicum of 100 hours with a preceptor. You will demonstrate competency to safely perform acupuncture and practice an Integrative Approach to Care using the tenants of Traditional Chinese Medicine. 1. Summarize an integrative approach to treating chronic pain patients and mental health disorders using acupuncture and other adjunct therapies discussed in the course. 2. Illustrate a basic understanding of how herbal theory is different from western medicine and how to apply it to an integrative therapeutic approach to care. Course materials will be accessible in each online module and distributed during the immersion weekends via internet postings and/or thumb drive. Printed handouts can be requested prior to the onset of classes at an additional cost and will be distributed in class and updated throughout the course. Electronic apps will be used to facilitate the learning experience to include on-line conferences, smart phone apps and verbal communications as needed. The Acupuncture & Integrative Medicine Institute (AIMI) is unique in many ways. Most of the acupuncture programs offered to western clinicians focus on the use of acupuncture as strictly a treatment option. Promoting the use of point formulas for specific disorders. AIMI, recognizes the importance and value of using Traditional Chinese Medicine not only based on its effectiveness at relieving pain or treating diseases but most importantly its ability to move and awaken the patients sense of awareness and how to use that response as a window to health. Unlike, the medically oriented programs that interpret TCM based on the paradigm of a physical body, or traditional programs that are unfamiliar with medicine, AIMI teaches TCM theory in its true narrative based on the concepts and theories of Qi and how to use those theories to not only expand the clinical approaches to treatment but also to assess the patients progress and subsequent level of healing. Because AIMI focuses on training Nurse Practitioners and other types of clinicians, our inclusion of TCM does not exclude the review or use of western theories but rather incorporate those theories with TCM to demonstrate how the two can be used in an integrative practice. Finally, AIMI recognizes and respects that the true value of TCM is not to treat diseases but to enhance the ability of the patient to heal. And in order to accomplish this one must be knowledgeable and aware of TCM theory and how to apply it. Therefore, we devote an extensive amount of time in live practicums, using experienced Licensed Acupuncturists to help students become not only efficient in theory but in practice as well.